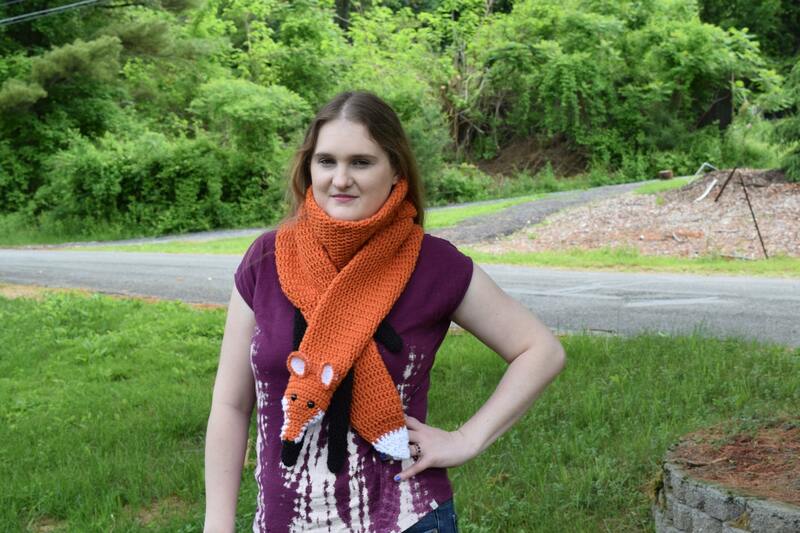 How adorable is this Fox Scarf? Foxes seem to be very popular right now. Here is your chance to be very stylish and unique. You can wrap it around once or twice with the tail and head in the front or you can wear it like a stole and put the head in front and tail in the back. Either way, you will love being very stylish. This fox Wrap is a darker orange with white markings on the face and a black nose. It has safety eyes and the head is slightly stuffed with poly fill. The tail has a cute little white tip. The Fox Scarf is double thick, very warm and soft. This scarf is approx. 62" long approx 5 inches wide. Hand Wash, Lay flat to dry. ( these come pre-washed) Handmade in the USA. Made lovingly in a smoke-free home with Durable Acrylic Yarn. These scarves are crocheted by me and are made to order so please allow up to 2 weeks for them to be made and shipped (although this is worst case scenario). Hand Wash, Lay flat to dry. Handmade in the USA. Please note that actual colors may vary slightly due to variance in computer screens and dye lots. Remember - this item will be handmade especially for you - your scarf may not look exactly like any others!